"I got the dove and took him to FTB. He or she is a handicapped dove. Cannot stand. Has a dirty dirty belly, and tail because of this. Has some narly feet (can move the toes, just not good enough to stand. Has some injury or developmental problem with the legs. The hocks (I think that was it is) were infected I think from sitting on them and having them rub on yuck. Anyway, Dr. VS kept the dove overnight to clean it up and treat it for lice and do a gram stain. It did not have diarrhea by the time I picked it up from the shelter, so that was good. Poor little thing. Will have to be a special needs dove. Anyone know anyone with that has a special needs dove who needs a friend? I'm expecting to pick it up tomorrow. It was a stray. Found off of Lean." 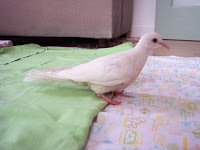 Tina named the little dove Piper and she made fast progress- regaining her strength and the ability to stand on her moderately deformed legs and to fly despite the poor quality of her feathers. Tina went from store to store looking for the dove food recommended by another MickaCoo volunteer (Kaytee Pet Dove Bird Feed Mix) and bought Piper flannel baby receiving blankets as recommended by Dr. Van Sant (soft and won't snag deformed little feet). Forty-five miles north and a week later, I took in an even more disabled dove- Pierre. He's splay-legged and, with his leg pointing out horizontally, can't stand, perch or walk. On March 14th, I picked Piper up and brought her home to keep company with Pierre. 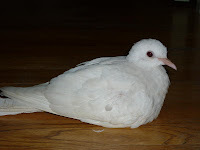 Doves, the very symbol of peace, can be surprisingly aggressive and mean to each other so I introduced them cautiously. Despite Piper's weakened condition, she was much more fit than Pierre. But there was no drama at all. Just a quiet energy, an invisible electricity, that made me feel like they were very happy to meet. They didn't fuss or talk it over or posture about who was in charge and who wasn't or any of that. They just assumed a friendship that made it seem like they had always known each other. And it continues like that. They are ADORABLE together, in their very subtle, understated way. Piper is a bit more adventuresome than Pierre and I think of her as the party-starter. Piper is a very special and sweet little dove in her own right and I am extremely grateful that she has befriended Pierre so warmly. While they are fostered and eventually adopted, they will be kept together and, when Pierre has had his corrective surgery and can stand and walk and perch, I think they will have many even more exciting adventures together. Click here to see lots of updates about Piper and her life with Pierre.